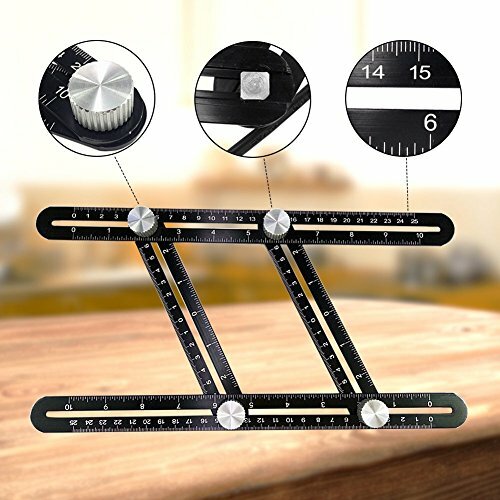 What is Multi angle measuring Ruler? It contains four slotted rulers which are joint together by four screws, and these screws can be adjusted, so it can be turned to any angle as required. Moreover, it can be locked into the shape as you need in minutes. The FULL-METAL Template Tool eliminates tedious guesswork and wasted materials from inaccurate cuts. It is a very handy personal or professional device for woodworking, project and DIY.It is also a great gift for handymen, builders, craftsmen, carpenters, roofers, tilers, DIY-ers. SIMPLE! Simply loosen the knobs on the tool and adjust the ruler to the angle OR shape you are trying to get. Tighten knobs for secure and precise alignment. Trace the lines and cut away! Eliminating hours of hassle and save thousands in material! You don't have to worry about flimsy plastic rulers ; now you can have a sturdy, durable, and able to withstand the daily wear and tear, aluminium angle ruler!Upgrade knobs can be fixed more easily. ★Full Aluminum Alloy Material - The Multi Angle Measuring Ruler is FULL made of metal, including the bolts! No longer waste money on a flimsy plastic ruler that will broken from drop ? Our tool is maximum durability. ★Easy to Use & Storage - Light and easy for one-handed operation, just place the template tool on your work area, slide the rulers into the shape you need, and tighten the screws. Then you can fix any desired angle for endless applications. ★Endless Applications- Four fold design, adapt to all angles in any position and shapes. Help to mark tile, brick, stone, lumber, laminate,metal and more. It is really a right-hand man for engineers, craftsmen, handymen, etc. ★Precise Scale- The scale deep printed by engraving,use 25 mm thick aluminum,will never wear; but ordinary models use 1 mm thick steel, printed on the surface of the substrate, will be worn out after long time use. ★100% Money Back - Risk free purchase and buy with confidence! If you don't like our product - return it. We stand behind all of our products, so you can return it within 60 days for a hassle-free, easy refund. If you have any questions about this product by Weekend fun, contact us by completing and submitting the form below. If you are looking for a specif part number, please include it with your message.